This is one busy Museum! Great Stuff! On-Going ~ Special Exhibit: 80 Years of Donkey Derby Days History. Come see our historic display of trophies, ribbons, donkey figurines, photographs and other memorabilia from Cripple Creek's most famous annual event. Monday, May 30 ~ Free Admission to All Veterans in honor of Memorial Day. Saturday, June 4, 4 p.m. ~ Herbal Remedies with Athena Wolfe. Enjoy a talk on medicines of the past. How did doctors of the 19th century treat illnessses? What were the home remedies and herbs used? What plants are still in use today? You'll find this out and more from Athena Wolf, a practicing curandera. $10 per person. Reservations requested. Contact www.curandera.com or info@curandera.com. Wednesday, June 8, 9 a.m. - noon ~ Knife Making Classes each Wednesday thru Sunday with David M.H. Smith. $50 per person includes instruction & materials. Reservations and pre-payment required. Contact http://csarts.us. Sunday, June 19 ~ Free Admission to all dads in honor of Father's Day! 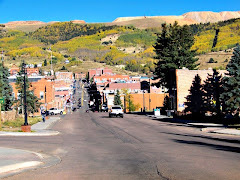 Monday, June 20 ~ Premier of Cripple Creek District, a pictorial history written by the Museum Staff and Board of Directors. Includes many never-before-seen historic photographs! Saturday, July 2, 6 p.m. ~ Evening at the Museum presents Doris McCraw as Katherine Lee Bates, the woman who wrote America the Beautiful. $5.00, pay at the door.